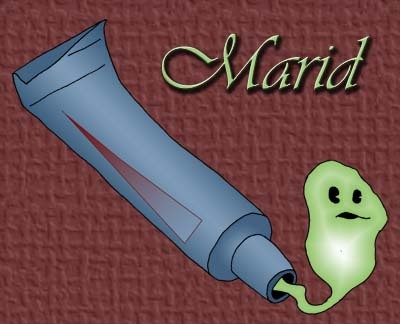 Marid was a small genie, not able to perform the large-scale "tricks" that are often associated with his species. Because of his size, his friends would often tease him. The latest of these pranks was to move Marid out of his golden flask and stuff him into a toothpaste container at a grocery store. Now he must grant wishes every night as his masters brush their teeth, ensuring that he would remain quite small. Can grant wishes of others, but not his own. "Do you want to get rid of your bad breath?"